Wanted! Baby Boomers and Boomer wannabes. Our facility offers a unique, peaceful setting for an alternative service for those with no church affiliation. If you are having a traditional religious funeral service our center is an ideal gathering place to spend a few hours with out of town or out of state friends and relatives. We have beautiful, comforting music in our relaxing comfortable lodge, We serve coffee, pastries, beer, and soda, plus catering is available. Outdoors you can stroll in our large lilac garden, which has ample seating, and take in the nature and beauty of the prairie. We also have a nice sized courtyard overlooking our duck pond. Plus we have a good sized deck with more seating available. 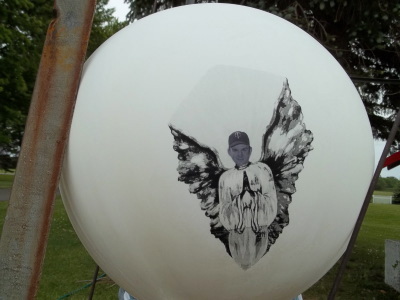 At the conclusion of your stay we release a beautiful custom angel helium balloon on a symbolic heavenly journey.